According to trauma expert Bessel van der Kolk, author of The Body Keeps the Score, understanding how trauma affects the body can help us distinguish between true trauma, and incidents that, while distressing, aren't really traumatic after all. In this video clip with Networker editor Rich Simon, van der Kolk explains. Bessel van der Kolk, MD, is the medical director of The Trauma Center in Boston, professor of psychiatry at Boston University Medical School, and codirector of the National Center for Child Traumatic Stress Complex Trauma Network. The bottom line, van der Kolk says, is talk therapy alone often isn't enough to treat trauma. 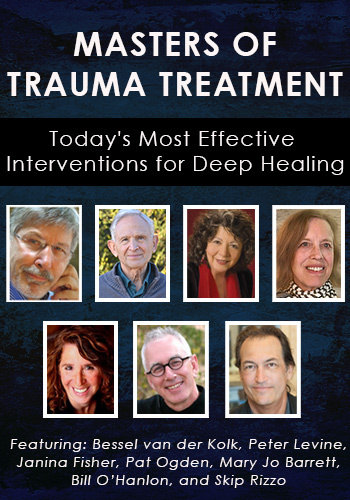 Follow the links below to read more about his recommendations for trauma treatment, as well as other mind/body strategies for helping trauma survivors recover. Check out our Masters of Trauma Treatment video course, featuring experts like Bessel van der Kolk, Peter Levine, Janina Fisher, and more! Check out van der Kolk's "Trauma: Retreats and Advances" in our magazine issue, The Connected Self, where he describes the evolution of trauma treatment as well as up-and-coming interventions, or "Outside the Box," by Mary Jo Barrett, where she explains the importance of including families in trauma treatment. You might also enjoy this clip from Peter Levine, in which he shares a personal story about working through trauma. "Threat we're not prepared to handle." It works for early attachment trauma and pervasive environments as well as events. Dr. van der Kolk has made contributions of critical importance to our understanding of PTSD and Developmental Trauma. If you want to know more about this go (back) to your first class of college physiology which describes the many body systems involving homeostasis. Trauma alters the set point of homeostasis of the stress response.